RIENZI, Miss. 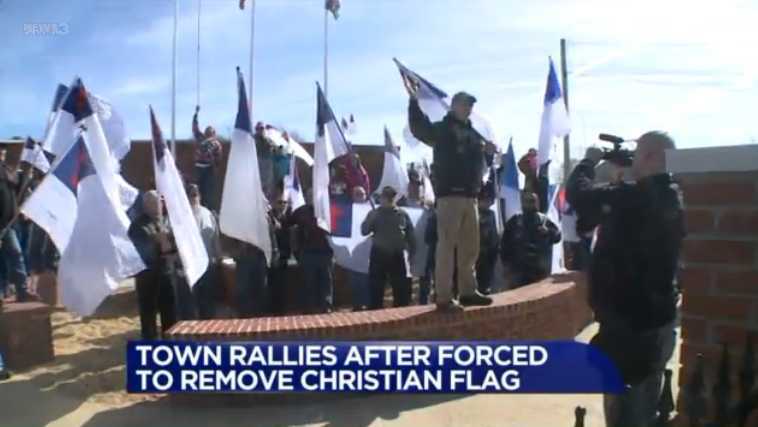 — Over 100 residents from a small Mississippi town rallied on Saturday after a complaint from a prominent professing atheist organization that took issue with a Christian flag being displayed in a public park resulted in the removal of the banner. The Wisconsin-based Freedom From Religion Foundation (FFRF) sent a letter on Jan. 20 to Rienzi Mayor Walter Williams to assert that the flag, which had been flown in Veterans Memorial Park, was unconstitutional. It said that it had been contacted by a local resident—who was not named—to advise them of the flag’s presence. FFRF urged Williams to utilize a completely secular display instead, and noted that it can be “quite costly” to ignore their request as another city settled with FFRF in 2015 for $500,000. As a result of the letter, Williams had the flag removed. On Saturday, more than 100 residents from the small town of 300 held a rally in support of the flag, some themselves bearing the emblem. “We’re not gonna let other people, or a foundation, or anybody else up in Wisconsin tell us that we can’t fly our flag!” organizer Kevin Nelms proclaimed to those gathered. “My whole point behind this [is], you’re gonna take one down, we’re gonna put a hundred back up,” he added to reporters. Supporters ran another Christian flag up the flagpole during the event. Nelms and his group rode from the VFW on their motorcycles to Veterans Memorial Park, flying the flag as they went. “As a proud American, but number one as a proud Christian, I came today to stand up for the Lord and stand up for our freedom,” participant Susan Woodruff stated. Williams says that he has hired an attorney and further discussion about the matter will be held at its next board meeting on Tuesday. He was among those who attended the rally on Saturday.